English language arts is an exciting subject that teaches students about the greats in literature and shows students proper techniques in a range of subjects that include reading and writing. The Praxis II Middle School English Language Arts (5047) Exam measures whether educators who want to teach middle school English language arts have the necessary skills. 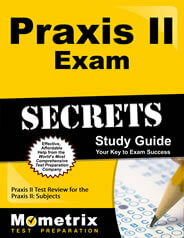 What can you tell me about the Praxis II Middle School English Language Arts (5047) Exam? Test locations: The tests are given on a computer at one of the available testing centers around the country. Candidates can take the test during one of several testing windows throughout the year. You’ll need to check the test schedule to see when the test is available. Candidates have 160 minutes (2 hours, 40 minutes) to complete 110 selected-response questions and two constructed-response questions. Selected-response questions have four, multiple choice answers and account for 75 percent of the test grade. The constructed-response questions require students to read a piece of content and supply their own answer. The constructed- response questions account for the remaining 25 percent of the score. What content does the test cover? Since each state sets its own certification requirements, you’ll need to check with your local agency to understand the passing scores and requirements. Also check to see when test scores will be available. Some candidates can get an unofficial score as soon as the exam is complete, while others may have to wait a few weeks. It’s the day of the exam. What can I expect at the testing center? Bring your test admission ticket and make sure to arrive at the testing center at least 30 minutes ahead of your scheduled test time. Anyone who arrives late may not be able to take the exam. Test center policies stipulate that, in essence, candidates can’t bring personal items into the testing room. Personal items include but are not limited to mobile phones, smart watches, tablets and any other similar electronics. Most jewelry, ties, scarves, hats and the like are also prohibited. Candidates don’t need to bring pencils or erasers because those will be available at the testing center. As you can see, the Praxis II Middle School English Language Arts (5047) Exam is a tough test to pass. 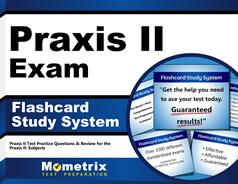 That’s way Mometrix has devised study tools to guide candidates through the testing process. Whether its problem solving, tips on answering difficult questions or navigating time issues, our study guide will walk you through issues that could pose difficulties. That’s not all. Our flashcards include in-depth explanations that can prove invaluable during your studies. These study tools will be a huge help during your preparation.